A: For our Basic Party package, during the first 40-45 minutes, the Mad Scientist will engage children with amazing science demonstrations covering a variety of cool and exciting scientific principles. 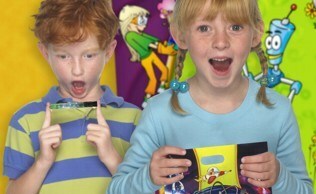 During the final 10-15 minutes of the party, the kids will make ooey-gooey Mad Science slime to take home. If you choose our Super or Deluxe Party packages, your party will include one or two of our Awesome Grand Finales (Bubbling Potions Show, Rocket Launch, or Hovercraft Rides), each of which adds about 15 minutes in total length to the party. A: Our party schedule fills up quickly. We suggest you book well in advance to get the date and time you want. Generally, at least 4 weeks in advance is recommended. A: Please call us at (757) 502-8124 and we’ll be happy to schedule your party over the phone. We require a 50% deposit to book your party and accept Visa, MasterCard, and Discover. A: Our parties are scheduled at 11:00am, 1:30pm and 4:00pm on Saturdays and at 1:30pm and 4:00pm on Sundays. Parties may be scheduled outside of these set time, subject to availability of our awesome Mad Science performers. Please call our office to confirm available dates and times. A: We service all of the Hampton Roads cities, including Norfollk, Chesapeake, Virginia Beach, Portsmouth, Suffolk, Hampton, and Newport News. We will travel to cities adjacent to Hampton Roads for an additional fee. Please call us to inquire about a specific city. A: No. All our party packages are priced for up to 15 children, so we are always prepared for 15 or fewer kids. Additional children may be added for an extra $6 per child. If you are planning to invite more than 15, we ask that you provide us the total number at time of booking. We will quote you a price based on the extra children, but you will be charged only for the number of ACTUAL extra kids attending on the day of the party. If all the planned extra kids do not show on the day of the party, your Mad Scientist will adjust your remaining balance so that you only pay for the kids who are actually there. Letting us know the planned number when booking helps us to ensure we have enough supplies on hand for your party. A: All our themes revolve around science. If you have another party theme, we can notify the Mad Scientist, and he/she will do his/her best to incorporate your theme into the experiments and language that is used. Please keep in mind that this is not always easy, so our recommendation is to keep your overall party theme related to science. 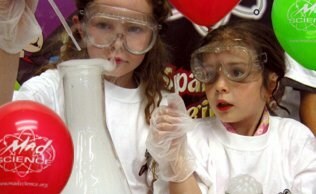 We can assist by providing high-qualtiy Mad Science Invitations and Goody Bags to supplement your party. A: The Mad Scientist will arrive at least 15 minutes early to set up and will be ready to start the show at the time you booked. Since our Mad Scientist may have another party to attend following yours, it's important that we do begin at your assigned show time. We recommend you tell your guests that the start time of the party is 15-30 minutes prior to the Mad Science start time to account for those running late, to allow time to get the children settled before the start of the show, etc. Q: What kind of space or equipment do I need to provide? is needed? A: You are responsible for providing a small table (4-6 ft. is best), access to electrical outlets in the space where the show is to be performed, and access to a water source for the Mad Scientist. We recommend any area where the Mad Scientist and his/her table can be placed at the front, with kids seated on the floor in front of the scientist. Living room/den, playroom, garage, or covered porch can work. If hosting outside your home, a rented room at a neighborhood/community rec center may work well. If choosing a restaurant, be sure to reserve a separate (preferably enclosed) room for the party, as opposed to a dedicated seating area in the main restaurant space. Our parties are designed to be performed indoors to ensure we can provide you with the best experiments and fun. Outdoor parties may be possible, but could result in us not being able to perform all experiments due to the environment. Q: How much space is needed for the rocket launch or hovercraft? A: The Mad Scientist will need a medium to large sized back yard or open space to launch the rocket. We make every effort to retrieve the rocket and allow your party boy or girl to keep it, if we can retrieve it safely. There are no guarantees the rocket will come down in your own yard once we launch. For the hovercraft, we require a space which has hard surfaces (hardwood, laminate, linoleum, concrete, etc.) -- the hovercraft will not work on carpet or on wooden decks (due to the slats between the boards). Access to a nearby electrical outlet is also required. The larger the space the better, since the ride will be more exciting for the kids if we have more room to maneuver. The hovercraft can be done indoors in a large room with furniture pushed back against the walls, in a garage, on a patio or carport, etc. Outdoor use is subject to weather conditions. A: Any changes to your party must be scheduled at least 3 business days before your party. Also, if adding Goody Bags to your party, we ask that you give us at least 3 days notice so that we can have them prepared and ready for your Mad Scientist. A: The Mad Scientist will begin at the scheduled start time and continue until our portion of the entertainment is finished. We will not be able to stop for any other activities. You may choose to conduct other activities (food, cake, present opening) either before or after the Mad Science portion of the party, but please remember that we do need to start our presentation right on time. Q: Can I have the phone number of my Mad Scientist? A: Our office will provide a confirmation call during the week preceding your party and will provide you with the name and contact phone number of your Mad Scientist at that time. If you have any issues or concerns on the day of your party (our office is typically closed on the weekends), you will be able to contact your Mad Scientist directly. A: Our parties are appropriate for children between 5 to 12 years of age. Younger siblings generally watch, but do not actively participate in the party. Younger children (generally at least 3 years old) may be able to make the take-home Slime project with assistance from a parent or older child. We determine the number of attendees based on the number of children who participate in the take-home project. A: We require a 50% deposit to book your party and will base it on the number of planned attendees at that time. At the end of your party, you will pay the Mad Scientist the remaining balance based upon the number of children actually in attendance as well as on actual number of Goody Bags used (if purchased). Final payment may be made with cash, check, or by authorization to charge the credit card we have on file. Q: Will I receive a refund on my deposit if I need to cancel my party? A: Cancellations received at least one week prior to the program date will be subject to a cancellation charge of $15. There are no refunds for cancellations within 7 days of the program, but you may reschedule and apply any deposits toward an alternate program date, subject to availibilty. A: If you think your Mad Scientist did a good job, gratuity is very much appreciated -- 15%-20% is customary for outstanding service. We do ask that you keep your tip and final payment to Mad Science separate. We are unable, for example, to separate out a tip from your final party payment made by check or credit card.